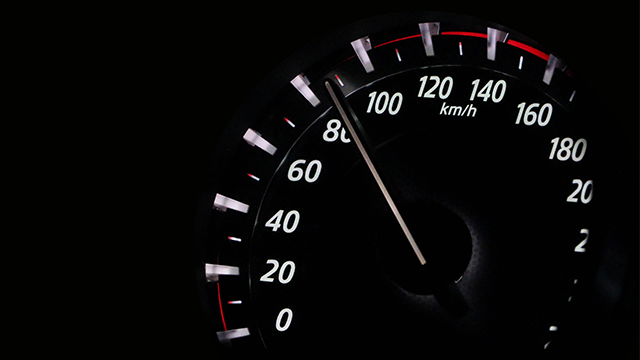 Home > Insights > Europe and Japan: back exporters in a catch-up rally? Europe and Japan: back exporters in a catch-up rally? The performance of European and Japanese shares has generally lagged US shares since the global financial crisis, but they now appear to offer scope for outperformance, especially if the $US remains strong. Furthermore, due to sector and demographic headwinds, any outperformance seems likely to especially favour exporters. 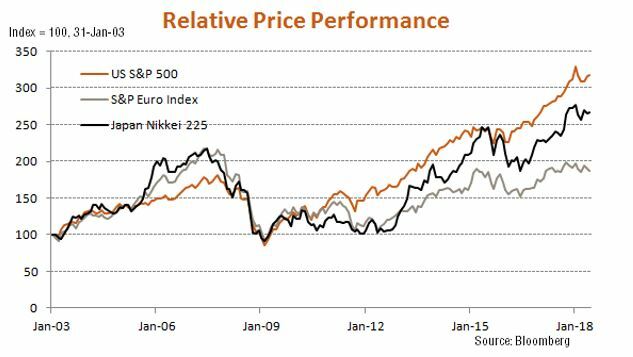 As evident in the chart below, European and Japanese shares have generally tended to underperform US equities since the financial crisis. Historically, this underperformance has been relatively more apparent in Europe. The main reasons for this historical underperformance differs for each of these economies. As evident in the chart below, Japanese earnings performance has been impressively robust (for a slow growing economy) and broadly on par with that of the United States in recent years. This has reflected an improved focus on shareholder value by Japanese organisations. 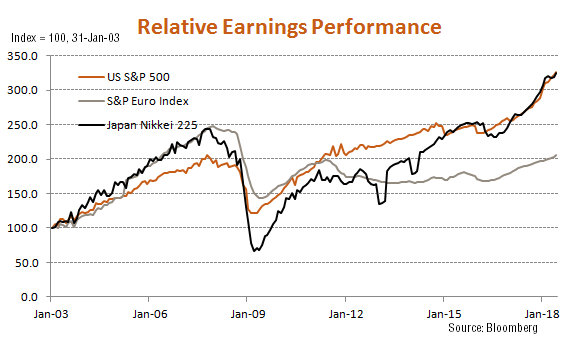 European earnings, however, have notably underperformed, though have nonetheless been on a rising trend since mid-2016. 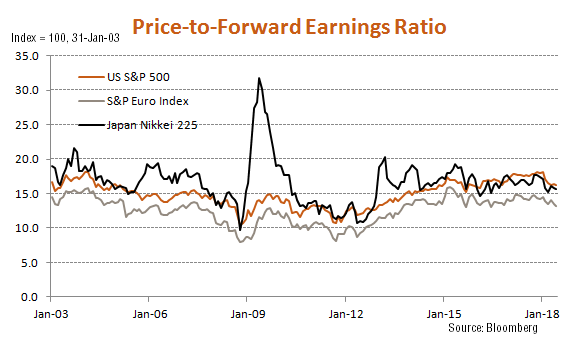 For Japan, therefore, the moderate underperformance in returns has mainly reflected a gradual evaporation of its historic price-to-earnings valuation premium compared to the United States. European valuations, by contrast, have always tended to trade at a discount to the United States, and this relative valuation has not changed all that much in recent years. As at end-June, Europe’s PE ratio was at a 5% premium to its average of 12.6 since 2003, compared with a 9% premium for the United States relative to its average of 14.9. So Europe is arguably relatively cheap, but only modestly so. By contrast, Japan appears cheaper, with a PE ratio 6% below its average of 16.7 since 2003. That said, as noted above, some of this apparent cheapness could reflect a trend narrowing in relative valuations – after all, even at end-June, Japan’s PE ratio was still only 4% below America’s. 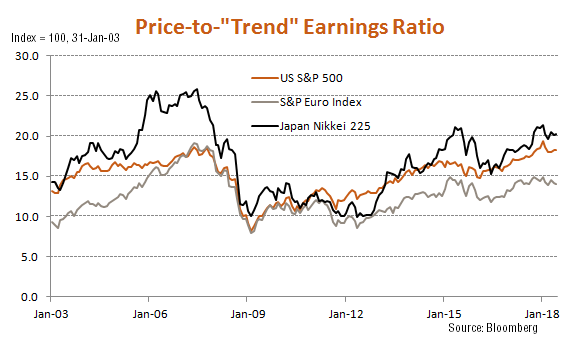 All up, price to current-forward-earnings ratios alone do not suggest European or Japanese stocks are obviously cheap compared to the United States. What about “cyclically adjusted” PE ratios? The case for relative value is on stronger ground, at least for Europe, when we consider prices to “trend” earnings – which I’ve estimated by the statistical “line of best fit” through earnings in each country since 2003. Comparing current equity prices to the current “trend” level of earnings is often described as a cyclically-adjusted PE ratio, or CAPE. On this score, Europe looks cheap, which reflects the fact that current forward earnings have been relatively weak in recent years and so still below their “trend” level. In other words, the price to current-forward-earnings ratio in Europe – while not that different to that in the United States – does not allow for the fact that earnings may be cyclically depressed (given they at are below trend levels) and so could be due for strong catch-up performance in coming years. Of course, the market may well be questioning whether Europe can deliver this earnings catch-up, given the various structural and demographic challenges it faces. Indeed, one factor that has hampered European and Japanese relative earnings performance in recent years has been their relatively low weight to the global tech sector (which has enjoyed strong earnings growth) compared to the United States. With technology likely to remain a relatively strong global sector, this will act as a headwind for earnings outperformance outside of the United States. Stronger population growth will also assist the US over time. On Europe and Japan’s side, however, is a likely boost to export earnings should US interest rates keep rising relative to their own, helping keep the $US relatively strong. The recently announced free-trade pact between Japan and Europe should also assist the relative performance of exporters in coming years. Once completed, this deal should especially improve market access for Japanese cars in Europe and European agriculture in Japan. Encouragingly, earnings in Europe and Japan did manage to outperform those in the United States earlier last decade prior to the financial crisis, and Europe also enjoyed good earnings growth in the 1990s. America does not always outperform! Either way, what does seem clear is that earnings among export-orientated European and Japanese companies are likely to outperform those of their more inwardly focused corporate counter-parts in coming years. We think there are also good reasons, particularly when looking at valuation differentials to believe that European equities may well provide strong performance for investors in the medium term. To the extent investors seek European and/or Japanese equity exposure, it might best be tilted toward exporters. 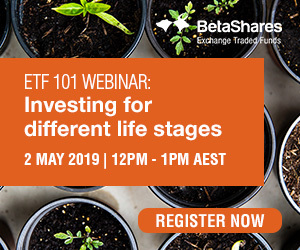 In this regard, investors seeking currency-hedged equity exposure to Japan and/or Europe can do so easily on the ASX through BetaShares WisdomTree Japan ETF – Currency Hedged (ASX Code: HJPN) and the BetaShares WisdomTree Europe ETF – Currency Hedged (ASX Code: HEUR). Being currency hedged, these ETFs are particularly advantageous to investors seeking either European and/or Japanese equity exposure on the view that their currencies will weaken further, thereby providing an export-led earnings boost to their markets. These ETFs also offer a further exporter tilt by only including companies that generate at least 50% of their revenue outside of their home markets of Japan and Europe respectively (amongst other eligibility criteria). Last but not least, the currency hedging implicit in HEUR and HJPN actually provides investors with an additional source of performance by way of the in-built ‘carry trade’ as between the foreign currency and the Australian dollar. 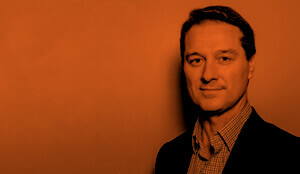 At present this is providing a net benefit to investors of around 2.5% p.a.